Search Results for "fishing trawler"
Seagulls chase a fishing trawler across a bay in Norway. Locked shot of gental waves splashing on the shore while a fishing trawler is heading away in the distance. Large fishing trawler moves slowly across Yeosu harbor on a clear sunny morning in Yeosu, South Korea. 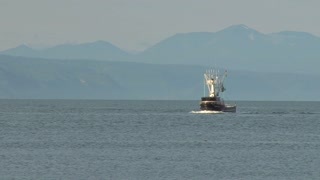 UNITED STATES: 1960s: fishing trawler on water. Man draws in fishing line by hand. 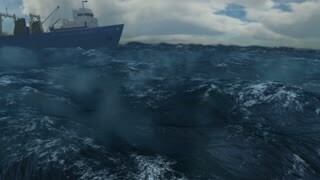 Slow motion shot of professional fishing boat or fishing trawler and flock of seagulls flying over the ship and surrounding it. Seagulls chase a distant fishing trawler across a bay in Norway. Fishing trawler. View from the main deck. Seagulls soar behind a board of the fishing trawler. Fishing trawler. Back part of the vessel. 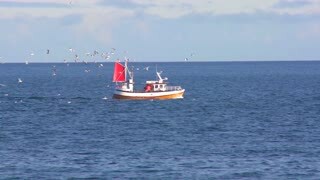 Pilot ship swims up to the fishing trawler. Seagulls on water behind a board of the fishing trawler. Shipwreck fishing trawler stranded in waves of sea on shore. Atlantic Ocean, Skeleton Coast, Namibia, Africa.